The 3rd battle between Newport and Baltimore added a chapter to the rabid Eastern seaboard sports rivalries between the two cities, going 6 chukkers in a near dead-heat to lay claim to the title this year. From Baltimore in blue were Nik Feldman #1, Walter Eayrs at #2, George Hempt at #3 and Max Hempt in the #4 position. Meeting the challengers were Newport’s Brandan Tetreault at #1, Dan Keating at #2, Hamish Wates at #3 and Dave Bullis at #4 in home team red. NPT was quick to the draw in the opening period, with the first point of the day by Keating, for a 1-0 lead. G. Hempt converted a penalty shot for Baltimore's first goal, but Keating reasserted the home team lead with another field goal in the second period, maintaining the slim 2-1 lead. All heck broke loose in the third chukker with BLT's offensive rally, taking the lead with two goals by Hempt father & son, until NPT's Bullis aligned a tying goal, only to be bested by M. Hempt to give BLT a 4-3 lead at the half. Wates was the lone ranger of the fourth chukker, with a field goal to even the score at 4 all, as both defenses held off earnest attacks. 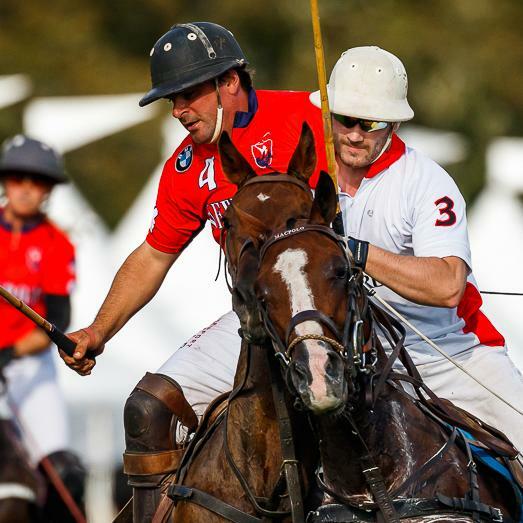 The fifth period was another explosive onslaught, as goals were traded lock-step, starting with BLT's Feldman, answered by NPT's Tetrault, then BLT's by G. Hempt, and a 2nd Feldman goal to pad the lead 7-5 going into the final chukker. Newport unleashed the cracken in the 6th chukker to the cheering audience's hopes with a battery of 4 goals for a decisive lead, starting with a penalty conversion by Keating, then a field goal by Bullis and two more by Keating, holding BLT to only 1 more Feldman goal, to claim the cup with a 9-8 home team win. During the match, a weekly door prize drawing from Opt Eyewear Boutique of Providence awarded a pair of designer sunglasses to a lucky winner, while the Best Tailgate earned the coveted special prize from Stella Artois. The hospitality and vendor villages bubbled with exciting offers of fascinators and jewelry, sunglasses, portrait photography, cutlery, leather goods from Brahmin, wine sampling, official polo team gear and concessions including the Twisted Pony Cocktail Bar, while this season’s new Veuve Clicquot champagne cart circled the field with bubbly service! Presenting the JB Leavitt City Series Cup was Sarah Dale from Where Boston magazine to the Newport team who hoisted the perpetual trophy high over the crowd during the Veuve Clicquot trophy celebration. Each member of the visiting Baltimore team received a commemorative gift, courtesy of Flint & Flame, purveyors of professional grade, precision culinary tools.